GIS Control Panel Testing – Crest Test Systems Pvt. Ltd.
Gas Insulated Switchgear (GIS) make use of sulphur-hexafluoride (SF6) gas as a dielectric medium for quenching the arc formed during contact separation. As SF6 has a strong dielectric strength, the insulation distances can be smaller. 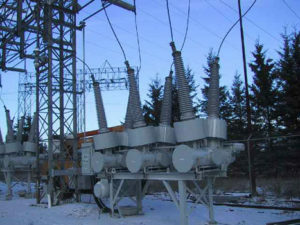 In GIS, all electrical components of the switchgear, such as, electrical bus bars, electrical isolators or disconnectors, circuit breakers, current transformers, voltage transformers, earth switches, and surge arrestors or lightning arresters are enclosed in a gas-tight enclosure filled with SF6 gas. This leads to a very compact switchgear design. Hence, GIS are very useful in urban applications where there are space limitations and installing conventional air or vacuum circuit breaker is not possible. Gas Insulated Switchgear are used in medium voltage and high voltage circuit breaker applications from 12 kV to 800 kV. GIS can be installed in city buildings, on roofs, on offshore platforms, industrial plants, and hydroelectric power stations. To test the functionality of the GIS control panel, connections need to be made between the GIS control panel and the entire GIS bay. 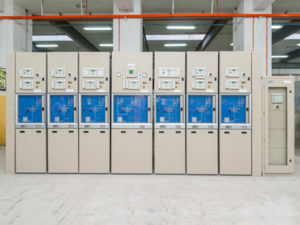 Typically, a GIS bay has approximately 100 NO-NC auxiliary contacts that are connected to the control panel through suitable connectors. These auxiliary contacts are used by the control panel for various indications, alarms, status sensing, etc. A Gas Insulated Switchgear consists of the following components, all enclosed in a hermetically-sealed metal enclosure, and filled with SF6 gas. Additionally, a control panel is present that is not enclosed with SF6 gas, but is very much a part of the GIS. Use shorting links and toggle switches to short terminals on the socket and check whether the control panel shows proper indications, generates alarms, etc. Continuity testers to check connections. To overcome the problems faced by manual testing, we at Crest Test Systems have developed a GIS Simulator to test the GIS control panels. The GIS Simulator has the same connection panel as the GIS drives. The control panel can be directly connected to the GIS Simulator through suitable connectors. The Simulator accepts commands from the control panel and gives NO-NC contact feedbacks to the control panel. After giving close or trip command, the user can observe the control panel indications, alarms, breaker status, etc. and verify whether the control panel is working fine or not. The GIS Simulator has been designed to test LCC panels of various ratings. It accepts close and trip commands from the control panel and simulates the auxiliary contacts changeover as per GIS specification. Our solution allows the user to check all the control panel parameters in one go.